WAS THE GREATEST CHESS SWISS TOURNEY PLAYER OF ALL TIME … PLAYED IN SEVERAL THOUSAND AMERICAN CHESS EVENTS (MANY PRE-1990 RESULTS … LOST FOREVER BY THE US CHESS FEDERATION OFFICE) … DREW WITH R. FISCHER IN THEIR FANTASTIC ONCE-IN-A-LIFETIME TOURNEY ENCOUNTER … WAS ALSO SERIOUS MULTI MILLION DOLLAR PRO POKER PLAYER AND LIVED HIS LIFE LIKE A BLOWTORCH … SURVIVED TERRIBLE ILLNESS … LOVED WOMEN AND FOUND A FANTASTIC ONE AND ONLY SOUTH AMERICAN WOMAN TO MARRY–THE RACQUEL ………………………………………………………………………………………………………………………. JUDE ACERS REMEMBERS CHESS GRANDMASTER WALTER S.BROWNE FOR CHESSLAB: The essential final conversation with Grandmaster Browne was also the last time I saw this fiery here, there, and everywhere poker-chess man … At the Hotel Provincial Restaurant/New Orleans 1993 … I spoke it to him straight as he was silent with wonder … teenager US junior chess champion Browne had hitchhiked in pouring rain from New Orleans to Baton Rouge Louisiana State University campus to play me a 6 game rated match (1967) winning easily … and played me an astounding drawn second match in Berkeley (Dennis Waterman’s home) 1970 which virtually made my career with coverage in the New York Times and London Times and a world top ten Acers theory game in Informator of Belgrade … Reminding Grandmaster Browne of THE REAL STORY, THE ABSOLUTE TRUTH … that he always was in training, paying attention to chess … newly minted grandmaster Browne rushed up to me at the Mechanics Institute/San Francisco and challenged a just arriving, silent, standing in the hallway stunned-beyond -words Jude Acers to a rated chess match out of the blue … he feared Grandmaster Kavalek would pass him in US rating lists if he did not play right away … JUMPING IN THE CAR IMMEDIATELY TO BEGIN PLAY, REALIZING THAT THIS WAS THE OPPORTUNITY OF A LIFETIME … I was hardly cooperative at the board and fought fiercely with lucky/seen by chance a week earlier … Petroff defense analysis of the great problemist and endgame specialist C. BILL JONES playing a huge part … the facts are now clear in hundreds of books/articles on the Petroff Defense worldwide … I drew with Fischer (74 BOARD simultaneous exhibition, New Orleans, 1964) and also won a seminal game versus Browne also with the Petroff Defense that absolutely made my career. In addition … a murderous, spectator packed 6 hour marathon draw with grandmaster Browne at “the tournament of the century” Sparks/Reno, Nevada, 1970, eliminated both grandmaster Browne and me from the tournament first prize hunt … My life totally changed … I was determined never to play again unless great events like this came up for me for the rest of my life … as with so many legendary chess people like Dennis the Water Man, Browne changed my life. 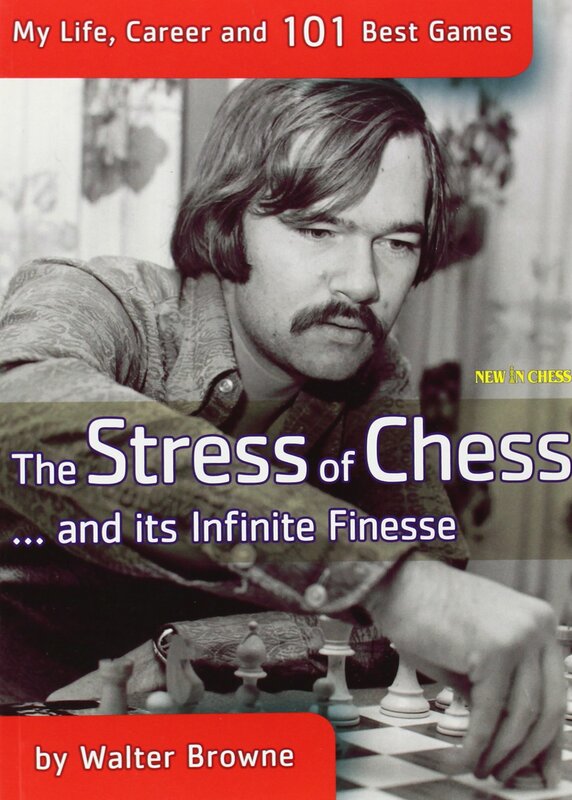 I have carefully considered this afternoon what the wrap up must be as the entire world chess press massively remembers his world chess/poker life, his INCREDIBLE book THE STRESS OF CHESS being the primary source of ready to pop last quotes in the media. Ok Jude … You know I am lucky … It changed my life and shook up yours a little as well! You deserve to know the real story … Here is how it came down … it really was unbelievable … with a teenage girl ticket taker at movie theatre, my parents plus Edmondson, Tony Saidy in on the kill…my walks around my New York streets, wild phone calls, and a wild New York taxi driver you would never believe … and a plane pulling out of dock without me. I was just hitting the street … looking for a card game. I had been all over the world already at chess tourneys looking for a grandmaster title shot because I could play for two countries, my parents from US and Australia … I had bombed out at the last second in Singapore World Chess Interzonal … but still became an international master though my opponent, a kind of person who does really does not care much about chess, won the tiebreaker and advanced to the world zonal grandmaster title qualifier … back home to New York for me, broke, bumming around. Looked bad, going nowhere, I was not really doing what I wanted to do … play chess … so what freaky things happen? A girl I had dated long ago in school was a ticket taker and she even snuck me in sometimes at a movie theater in the afternoon … I passed the ticket booth, waved just like always and buzzed on just like always … a whole block down the street … and screaming behind me she came, “WALTER, WALTER YOUR PARENTS WANT YOU ON THE PHONE. YOU GET A GRANDMASTER QUALIFIER CHESS TOURNAMENT IN PUERTO RICO BUT YOU HAVE ONLY EIGHT HOURS TO GET THERE!” … It was that close already … I swear … 30 seconds later and forget it, finito, she would never have found me … Okay, I rush home, learn that Tony Saidy had cancelled out but sharply, mercifully phoned the chess tourney 24 hours in advance to let them get another certified international player … okay, Bisquier is already the American player … I also count as foreign Australian player through dual citizenship … so Ed Edmondson at the US chess office alertly snuck me in if I could get there … JESUS CHRIST it was close … and they give me all the family house cash, stashed in my jeans, suitcase in 5 seconds, and I franticly looked for a cab headed to the last possible San Juan plane … okay, I head to the airport and flash cash to the mad taxi driver who goes floor speed all the way … I run to the airport gate with ticket in hand and the gate door is closed and the plane is pulling from the dock … “OH PLEASE, OH PLEASE, I HAVE TO MAKE THE PLANE TO BECOME A CHESS GRANDMASTER … OH MISS, PLEASE.”… Then, Jude, I did something crazy … I can’t explain it … I know people are impressed by cash green subconsciously. I took all my money out, held it up with both hands … and said, “I give it all if you get me on the plane OH Please Oh Please”… and Jude that blessed woman called the captain and he opened the side door for me … Jude, face it … just say I don’t by chance date the babe in school … my life … even your life is totally different. Luck is so strange.